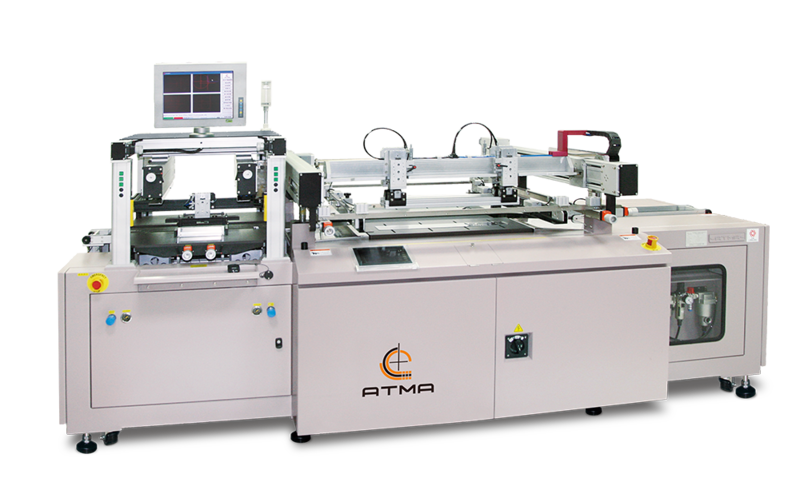 Automatic feeding with CCD registering - printing - take-off, fully automatic processing, unique design, excellent feature and high precision. Advanced structure, rigidity with light weight quality to match up top class transmission (4 servo + 2 tep+ 2 DC brushless + 2 AC gear motor ) and linear guide rail leading system. 100 groups memory of production condition + operating in coordination with hand wheel to adjust setting substrate size, saves adjustment time to raise productivity. IPC+ colored touch-screen + colored LCD display, digitalized control to provide various function of parameters setting and instantaneous monitoring, convenient operation. Equipped with automatic error diagnosis system, safety restoration loop, safety light barrier, emergency stop button, warning lamp and so on human safety thorough protection. Workflow direction right-in left-out / Ink Shovel/ Dripless dual device / Double peel-off / Table displacement / Screen displacement.